The USDA has updated their Plant Hardiness Map that divides the nation into regions based on average minimum temperatures. These are not absolute minimums, but average annual temperatures. These Zones are used to describe the range in which plants are adapted to and can be grown. We list these Zones for each of our products. Dark Purple is Zone 4, Blue Zone 5, Dark Green Zone 6, Pale Green Zone 7, Yellow Zone 8 and Tan Zone 9. Use the link to plug in the zip code where you will be planting for specific plant zone. Our climate in the South is a result our proximity to the ocean and our latitude, which creates the long hot summers. From October to April we can get strong blasts of cold from arctic fronts moving down over the continent, but the cold usually passes quickly. Along the coastal plains, the effect of the warm water of the Gulf of Mexico and the Gulf Stream along the Atlantic Coast serve to modify the effects of the cold fronts, so the minimum temperatures rarely stay below freezing for long. The mild climate of the South allows us to grow a wide diversity of plants and trees. 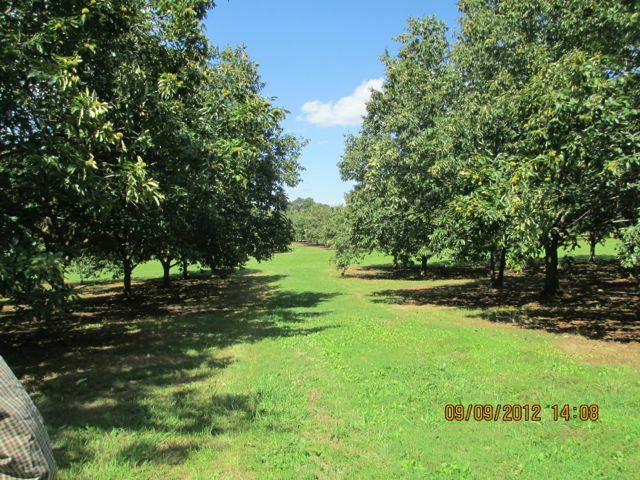 We can grow many species from the temperate hardwood forests such as oaks, maples and magnolias. Along the coasts from NC to Texas, there are many cold-hardy tropical trees such as citrus, bananas, and even avocados that can take sub-freezing temperatures. There are new varieties of low chill apples, peaches and plums bred by the University of Florida that can be planted as far south as south Florida! These are also the best cultivars for the coastal environments which will bear fruit where northern varieties will not bear fruit or survive for more than a few seasons. This is because of amount of Chilling Hours received. You must plant the right variety for your area. Native flowering trees also have chilling requirements and are adapted to different Zones. Make sure you purchase plants that are adapted to your Zone. Inside these Zones, variation in elevation, site location, directional orientation and proximity to bodies of water such as lakes or oceans can create variation in temperature than can raise or lower the temperatures experienced at the site. These microclimates can allow or prohibit the planting of particular plants. For instance, cold hardy citrus can be grown along the coast or on islands even as far north as South Carolina, where the effect of the warmer ocean keeps the air temperature from getting as cold as even a few miles inland. Trees that break dormancy early may likewise be damaged by late season frosts that settle in frost pockets at the bottom of valleys or even swales, whereas higher on hillsides the cold air drains off down to the bottom and does not damage the trees. The south side of a house can be much warmer with winter sun and protection from cold north winter winds. The mass of the house emanates heat at night, allowing planting of cold sensitive plants close to the building. Similarly, temperatures in cities are often much warmer than surrounding countryside, where asphalt and buildings store heat. Consideration of microclimate is very important in choosing what to plant. Soils throughout the South vary widely, from the red clays of the Piedmont to the deep sand of old beachfront dunes or the hardpan of poorly drained flatwoods in Florida. Ideal soils for growing are well-drained, sandy loams, which are relatively common in much of the farm lands and river bottoms of the south. A clue to the productivity of the soil are the types of native trees growing on the site. If it supports large oaks, hickories and other hardwoods, it is probably very good. If the only trees on your land are pines and saw palmetto, then you will have to add organic matter and nutrients to the soil. The type of soil you have sand, clay, or loam influences how fast water penetrates before running off, how often plants will need to be watered, and how much water you'll need to apply with each irrigation. Observe what happens to your soil when you wet it. Loam soils absorb water at an even pace without heavy puddling or runoff. You can recognize loam by picking up a moist handful; when you let go, it holds together but falls apart easily with some gentle prodding.Most soils are a mixture of clay, sand, and loam. Identify what predominates in your soil and adjust your watering accordingly.Local Agricultural Extension offices will often perform soil analysis as a free service and they will recommend what treatments will be necessary to create an optimum environment. Trees are likely to get too little water in well-drained soil and to much in soil that is poorly drained. We recommend for best success to supplemental water your newly planted trees for the first two years.